Here’s another slightly different recipe for pancakes from Morocco. 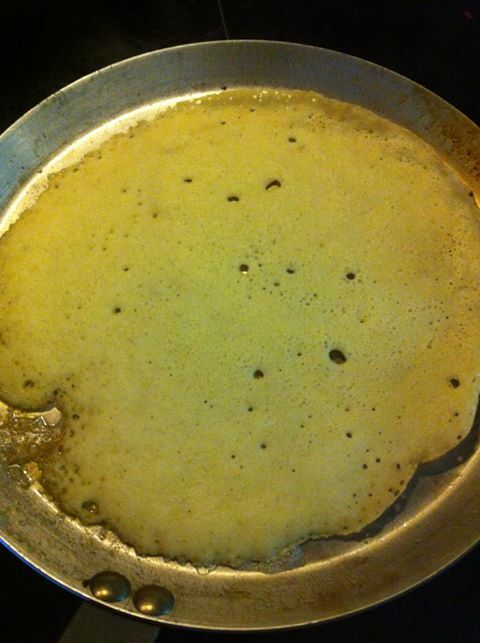 Beghrir or the thousand holes pancake. It has got the name after the hole formed when frying pancakes. The more holes that are formed , the better it becomes. There is an art to get those pancakes perfect, but practice makes perfect , is a common saying . Another important thing is that you just bake it from one side. So be one side without baking . An important ingredient is also the semolina , which gives it its character. Mix the semolina, flour , salt and sugar in a bowl. Warm the milk . Add the water . Beat in the eggs and crumble the yeast. Stir until the yeast has dissolved, then put the liquid into the bowl with the dry ingredients and stir until it is smooth. Let rest in the refrigerator for a few hours. Fry the pancakes of batter but only on one side ! The formation of small holes, which also gave the name 1000 hole cake. Serve them warm with syrup or honey and a glass of tea.